Welcome to the 2017-2018 school year! This is an exciting time to be a Golden Eagle as we are implementing our 2020 Vision for Instruction and we are working hard to “inspire and guide each student to his or her maximum potential” every day. At the same time, our district faces huge enrollment challenges as we experience unprecedented growth. We have worked closely with our community-based Facility Planning Committee to recommend a bond and permanent improvement levy that will appear on the ballot on November 7. Visit our November Ballot Issue Info page for additional information on this critical issue. As superintendent, my focus is to collaboratively set a vision for the district and to allocate resources for our students to meet that vision. In addition to working to secure additional learning spaces through our November 7 ballot issue, I guide our administrative team in providing staff members with the resources to help students receive the best educational experience possible. We must prepare our students for jobs that don't even exist yet by teaching them to think critically, to collaborate, to communicate, and to create. Amazingly, 65% of our kindergarten students are anticipated to work in jobs that HAVE YET TO BE CREATED. Clearly, just teaching these students to memorize facts will not prepare them for life after school, which is why shifting our classrooms to meet our 2020 Vision for Instruction is so important. Personalizing Instruction: Teacher is constantly aware of individual student abilities, interests, and/or learning styles and uses that information to make instructional decisions. Engaging Students: Students are immersed in the classroom atmosphere-- lessons/activities are meaningful, relevant, and add immediate value to their learning. Growing Minds: Teacher collects student data and uses it to drive instruction and make class decisions in order to promote student growth. We are working with our teachers to continue to move toward implementing our vision in all classrooms by 2020. This year we will be focusing on replicating real-world job experiences for our students. Please visit our Academic Achievement page for more detailed information about the 2020 Vision! If you are new to the district, welcome! Please visit our Student Enrollment Center for information on enrollment or contact any of our school offices to schedule a tour. Big Walnut is truly a special place with a small-town community feel and top-notch opportunities for students. Angie Hamberg joined the Big Walnut Local Schools in 2009, when she was hired as the middle school principal. 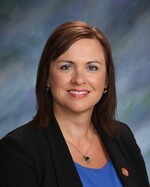 She also served as the district’s Director of Academic Achievement and assistant superintendent before becoming the superintendent in June of 2015. Angie has a Bachelor of Science degree from Ashland University and a Master of Education in Educational Administration from Ashland University. Besides her experience in Big Walnut, she has taught high school English and has been a middle school principal, and a high school assistant principal and athletic director. Angie and her family live in the district in Kingston Township and her three children are proud to be Golden Eagles!